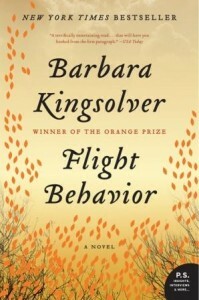 Flight Behavior by Barbara Kingsolver follows Dellarobia Turnbow's accidental discovery of millions of monarch butterflies wintering on her husband's family farm in rural Tennessee instead of in Mexico. Dellarobia married her husband, Cub, at seventeen when she found herself pregnant. Now she is 28 and unhappy in her current life, the stay at home mother of two living in the shadow, and under the thumb, of her husband's parents. She discovered the butterflies when she had all intentions of running away, looked like a lake of fire to her and resulted in sending her back home. Her "vision" ends up being called a miracle and may result in saving her family financially, but the monarchs are actually a disturbing result of something much more ominous. When word of the monarchs gets out, a college professor, Dr. Ovid Byron, arrives along with others, to study the phenomena and try to find an explanation for what could result in the demise of the monarchs. Additionally, Bear, Dellarobia's father-in-law, is also a real threat to the monarchs as he is strapped for cash and plans to have the area the butterflies are in logged, clear cut. With her husband Cub a passive follower of his parent's wishes and a mother-in-law, Hester, who has never liked Dellarobia, it seems she is the only one listening to the warnings of Dr. Ovid and the other researchers. Flight Behavior can be found in many of the characters. Dellarobia is obviously fighting her desire to flee. But it soon becomes clear that all the characters have something that they are fleeing from or would like to escape or even run toward. Even as the monarchs are in a new wintering area that is most certainly not going to be hospitable to them, all the people coming to study or see the butterflies are moving into Dellarobia's world, one that they don't understand and hold many assumptions about. The news media spins the story of the butterflies into a miracle rather than telling the horrible truth they really portend. Kingsolver uses her both her degrees in biology and Appalachian roots as she delves into the effects of global warming in Flight Behavior. Rather than ramming the information and how we can help into the novel, she takes it to the level of Dellarobia. One good example occurs about 2/3rds of the way through the novel when Dellarobia is told what is in a pamphlet on how she can help prevent climate change by a man who says that her people (implying local hicks) need to read the information more than anyone. The thing is that most of the ways people can help that are in the pamphlet don't apply to her at all. She doesn't eat out; she doesn't make unnecessary trips anywhere. She always shops at thrift stores. She is actually more on track because of necessity than many of the citizens the man assumes are better informed. Flight Behavior has been on several lists as the best book of the year or a notable book to read. The laudatory comments are well deserved. It is an extremely well written novel that delivers a message without becoming too heavy handed. I'll admit that even though I didn't care for the character of Dellarobia at first, I did come to appreciate her and the growth she shows in Flight Behavior. Even as the scientists struggle to answer questions of why this is happening, Dellarobia asks and answers her own questions of why concerning her life and choices. Flight Behavior is certainly a novel that held my rapt attention and I very highly recommend. Barbara Kingsolver’s work has been translated into more than twenty languages and has earned a devoted readership at home and abroad. She was awarded the National Humanities Medal, our country’s highest honor for service through the arts. She received the 2011 Dayton Literary Peace Prize for the body of her work, and in 2010 won Britain’s Orange Prize for The Lacuna. Her novel The Poisonwood Bible was a finalist for the Pulitzer Prize. Before she made her living as a writer, Kingsolver earned degrees in biology and worked as a scientist. She lives with her family on a farm in southern Appalachia. Excellent review--very different than my TLC post (although we both enjoyed the book).